The diverse climatic zones that were given to Azerbaijan by nature presuppose that the country can develop agriculture not only for the domestic production, but also import to the world markets. One of such highly valued products is nut and hazelnut in particular. The country has all the possibility to develop this type of agriculture as hazelnut is relatively undemanding culture, and the cost of maintaining hazelnut trees is not high. Last year, neighboring Turkey – one of the leading supplier of this costly nut – has broken records in hazelnut export. According to the Black Sea Hazelnut and Its Products Exporters Union, Turkey exported 240,137 tons of hazelnut, which brought profit of $2.8 billion in 2015. Production of hazelnuts in Turkey usually reaches nearly 600,000 tons a year. As Turkey produces most of the hazelnuts in the world, the prices for this products depends on this production. Prices for hazelnuts and hazelnut products increase around the world when the hazelnut season is not productive in Turkey, as it was in 2014. However, last year, the prices for hazelnut were not at their highest position. Nuts are the most popular form of natural snacks around the world. Among them, hazelnuts are famous for their sweetness and incredible nutrition. Being very high in energy and loaded with numerous health-benefiting nutrients, hazelnuts are essential for good health. Hazelnut is used not only as snack itself, but also in the production of chocolate, sweets, as well as the world famous Nutella spread. Originated in southern Europe and Turkey, the hazel tree is now being cultivated in many regions of the world. 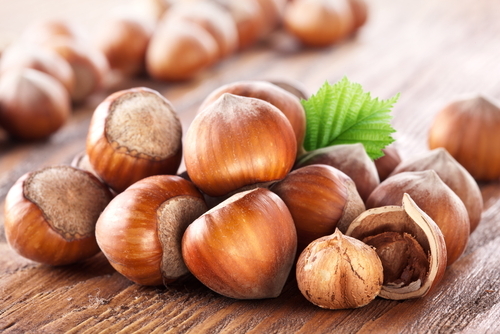 Along with Turkey, hazelnuts are produced in commercial quantities in Azerbaijan, Italy, Greece, Cyprus, Georgia, Spain, the UK and the U.S. In 2012, Azerbaijan entered top ten countries with the largest production of hazelnuts, according to the Food and Agriculture Organization. However, the country could not reach large revenues from the export of hazelnuts. At present, the production of hazelnuts is at its best in the country. In 2014, Azerbaijan has grown 30,039 tons of hazelnuts, according to the State Statistic Committee. It was the highest production rate from 1998. The country renders suitable 30,600 hectares lands for hazelnuts, which productivity is 11.8 centner per hectares. In Azerbaijan, the best regions for hazelnut production are Shaki-Zaqatala and Guba-Khachmaz economic regions, as well as Ganja-Gazakh region. “Azerbaijan has all the necessary weather and climatic conditions for the cultivation and production of hazelnuts,” the Azerbaijan Hazelnut Exporters Consortium believes. The Consortium is providing information, analytical and advisory support as well as promoting Azerbaijani hazelnuts in international markets. The organization is able to supply hazelnuts to international markets in the shell and hulled raw hazelnuts, blanched and sliced hazelnuts. Azerbaijan produces such types of hazelnuts as Atababa, Ashrafli, Ghalib, Ganja, Sachagly, Topgara and Yagly, while the most popular types of these nuts are Atababa and Khachmaz. Economy expert Oqtay Haqverdiyev told Azernews that production could be slightly enlarged in Azerbaijan, as there are several regions where this nut can be grown in Azerbaijan. “We have a plant for hazelnuts production, and the production can be increased, with new plants opened in the regions where it is grown,” he said. “Traditionally we are exporting hazelnuts to Italy,” the expert said, noting the fact that export to Russia can also be rearranged, while this country refused Turkish products. “However, the volume of hazelnuts from Azerbaijan is not so large, so we cannot meet the demand of Russia,” he stressed. Haqverdiyev believes that fat content of the Azerbaijani hazelnut is more than its Turkish equivalent. However, the Turkish nut is bigger and more uniformed in size and appearance. As it is the plurannual plant, it gives first harvest after some five years, the expert said. Thus, farmers should be supported by the state to tend these plants during the growing period. This support can be expressed in the form of loans with favorable conditions.